Having a problem with the rear main seal in your vehicle can be a scary thing, mostly because many of us don’t entirely know what that seal is or does. We’ve only heard horror stories about friends who had great reliable vehicles that developed a rear main seal leak and suddenly their car was only fit for a junk yard. Here at BlueDevil we’re hoping to change that myth. The rear main seal is a seal in your engine that is very important and usually difficult to reach. If you pop your hood and start looking around for the rear main seal, you aren’t going to have much luck seeing it. It is buried deep, usually under a lot of protective covers, wires, hoses and unfortunately, the bell housing of your transmission. Let’s first break down the name to see what we can learn about the rear main seal. First, the rear main seal is at the rear of your engine. This can be confusing today because the rear of the engine isn’t always at the rear of your engine bay. On a rear wheel or 4 wheel drive vehicle the engine is mounted with its front (the side with all the pulleys and belts) towards the front of the car. With modern front wheel drive cars, and some all-wheel drive vehicles the engine can be mounted transversely in the vehicle. This means that the front of the engine can be facing either the passenger or driver’s side of the vehicle. So the “rear” in rear main seal refers to the seal’s location on your engine, and not necessarily relative to your vehicle. The rear main seal is always on the opposite the side of your engine as the pulleys and belts. Second, the rear main seal is a seal for the main crank shaft bearings in your engine. Since the crank shaft has the piston attached to it, the pulleys with all your accessories connected to it and the flywheel which connects to your transmission on it, it carries all the forces and power your engine creates. Since the crank shaft has the toughest job, it gets the biggest and best bearings to make sure it can stand up to the work load. 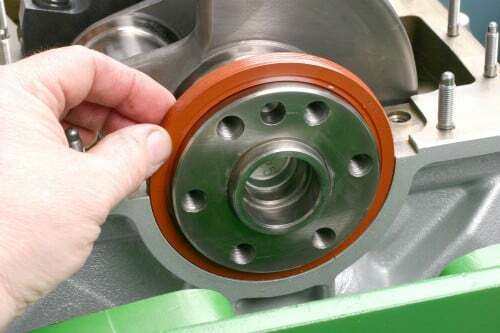 These bearings are called the main bearings in your engine and carry the majority of the stresses on your crank shaft. The rear main seal is just on the outside of the rear main bearing and it keeps the engine oil from leaking out where your crank shaft exits the engine. The outside circumference of the rear main seal creates a seal between the engine block and sometimes the oil pan as well. The inside of the rear main seal creates a seal on the crankshaft where it exits your engine to connect to the transmission. As the crank shaft spins, it can wear down the rear main seal, especially if a low oil condition exists in the engine, or the vehicle sits for a long time between uses. Because of its location in the engine, replacing a rear main seal includes at least removing the transmission from your vehicle, if not completely removing the engine as well. 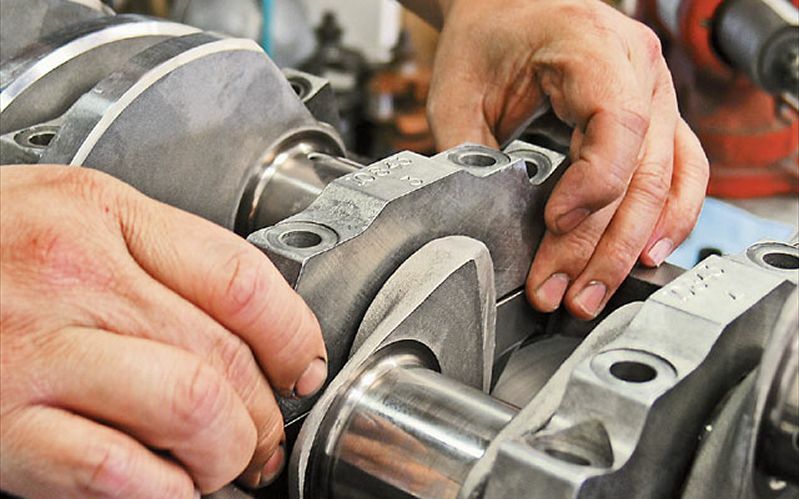 Removing either the engine or the transmission from your vehicle is a difficult and time consuming job, usually making a rear main seal replacement a very costly project. This is why you hear so many horror stories about the unbelievable costs of fixing a leaking rear main seal. The good news is that BlueDevil has created a way to seal your rear main seal leak easily and permanently without costly maintenance and long projects. BlueDevil Rear Main Sealer is a specially formulated additive that you add directly to your engine oil. BlueDevil Rear Main Sealer is not a petroleum distillate, powder, or hazardous chemical so it will not harm your engine in any way and can stay in your engine oil until your next oil change. Once BlueDevil Rear Main Sealer is in your engine it will revitalize the old seals you have, restoring them to their original size, shape and flexibility permanently sealing your rear main seal leak – guaranteed! You can also purchase BlueDevil Rear Main Sealer directly from BlueDevil. Please contact me as I have sent an e-mail to your tech department. Thank you. Our tech department has responded direct via email. Where is the rear main seal at on a 1982 f250 auto with a 400 and do you have to remove the tryanny or the motor or both? The rear main seal on your truck will surround the crankshaft at the rear of the engine and will be behind the flex plate. If you have a 1 piece rear main seal (found on most new 351 motors) you will have to remove the transmission to replace the rear main seal. If your motor has a 2 piece rear main seal (found on older 351 and 460 motors) you should be able to replace it by simply removing the oil pan and the last main bearing cap. I have a 2001 Jeep Cherokee with the 4.0 in-line six cylinder engine. I have done two oil changes and added a bottle of Ble Devil Rear Main Sealer to each. After driving the vehicle for longer periods it doesn’t seem to leak, but on short trips it still drips a little on the exhaust manifold (I can smell it) and leaves about a dime size spot overnight on the driveway. My question is would it do any good or better to use “two” bottles possibly to correct the problem? Thank You! You still only want to use the recommended amount, 1 bottle, with each application. We do not recommend adding 2 bottles at the same time; you would be better off simply retreating it with 1 bottle. I wanted to thank blue devil for there commitment and dedication to not only perfecting a great product, but for helping those in need. I have a family of 5 and only one working vehicle – a 2001 Toyota Sienna. 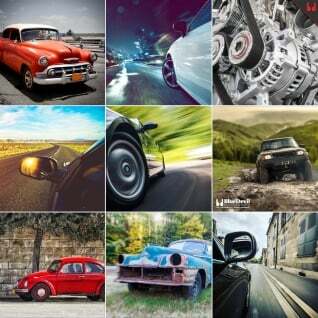 With only one income, another vehicle is just not possible at the moment. My rear main seal went out in August 2014 and with almost 200,000 miles, I couldn’t find a mechanic willing to replace my rear main seal. Then, I heard about Blue Devils Rear Main Seal Stop Leak. After two weeks the leak stopped and the Toyota is doing fine. I’m so thankful that for just $15.00 my vehicle is ruuning just fine. Would this product work on a vehicle using synthetic Mobil 1 oil ? Yes, the BlueDevil Rear Main Sealer can be used with synthetic Mobil 1 oil. It is 100% compatible. Any guidance with your product and a 1999 Toyota 4 Runner – V6? My concern is a non standard oil cooling system that utilizes coolant and can become blocked with sealers. The BlueDevil Rear Main Sealer does not thicken or harden so there is no risk at restricting flow or causing any type of clogging. The BlueDevil will react specifically with the rubber seals and gaskets by rejuvenating and slightly expanding them. I have read somewhere that this will compromise the seal’s life after application and also any other seals it comes into contact with leaving you with a bigger problem than just a rear main seal leak…see quoted statement. Thanks for your question. There is truth to this statement if you use products that contain petroleum distillates. Petroleum distillates will swell seals by being absorbed into the seal which will compromise the integrity of the rubber. BlueDevil products do not sue any petroleum distillates to recondition seals so our product creates a permanent seal. Hello, I strongly believe the real main seal is leaking from an early, rebuilt, 1950’s 8BA Ford Flathead engine. Have you had any experiences with this application? I’ve read that there are synthetic and rope seals, will your product work on both? The BlueDevil Rear Main Sealer would only be intended for the rubber seals. It would not have any effect on rope, cork or any other type of material that may have been used. If it is indeed a rubber seal, and you are not losing oil too quickly, you would be a good candidate for the product. You can expect to see results after about 100-200 miles of driving. I have a 2010 Kia Soul. I’m at the shop now and they found a cam seal leak. What’s the difference between that and a main seal? Thank you for asking about your Kia Soul. The difference would be in the location of the seal. The cam seal is located by the timing chain cover and the rear main seal would be at the back end of the engine. Feel free to contact us at 888-863-0426 with any other questions. i have a 2008 Chevy Malibu and have a really bad oil leak coming straight off of the oil filter we have tightened the filter numerous times and it keeps coming loose . Could it have something to do with rear seal ? Thank you for asking about your Chevy Malibu. 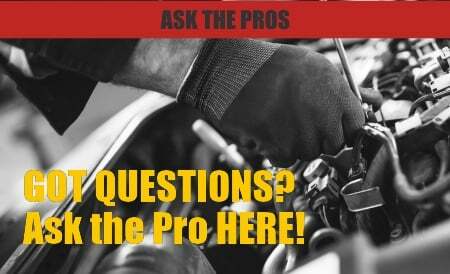 Based on your description, there may be an issue with the oil filter housing gasket. We recommend having the oil filter housing gasket replaced to stop the oil loss. Will your product work on front engine seal as well? Based on your description, we recommend using the BlueDevil Oil Stop Leak (http://store.gobdp.com/oil-stop-leak-49499/) for your front engine seal leak. The BlueDevil Oil Stop Leak is a universal application, and will treat leaking oil pan gaskets, valve cover seals, rear main seals, etc. where as the Rear Main Sealer is specifically formulated for the rear main seal.